I was feeling nice and easy, just in the right mood to prepare for the Lost Ingredients panel. Unfortunately, the snafu started early, and the big box o’ falernum that I’d spent the better part of a week and not a small amount of money making was nowhere to be found. 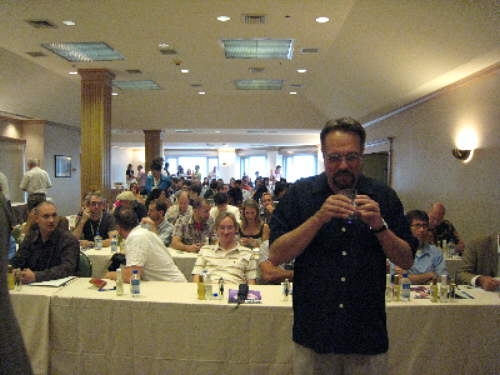 Five minutes before the panel, the setup crew still hadn’t found the falernum, which meant I had to change my presentation on the fly, which was probably patently obvious to all 150-someodd people in the room. No matter — after my hands stopped shaking and I rushed my way through what was left of my presentation, I got to sit and watch as my co-panellists took the mike. Chuck Taggart detailed his work with pimento dram; Joe Fee covered his falernum and his bitters; Gwydion talked about his Marteau absinthe, due to be available online in a matter of months; Eric Seed poured samples of Swedish punch and his new creme de violette, which was a big crowd pleaser. All of that would have been enough, but then Robert Cooper got up and unveiled a double whammy: as the owner of Jacquin, which formerly made the highly sought-after Creme Yvette and Forbidden Fruit, Cooper revealed that the company is exploring the re-release of Creme Yvette, and poured samples for the crowd — huzzah, suddenly there are two samples of violet liqueur on the table, when six months ago it was impossible to find any. 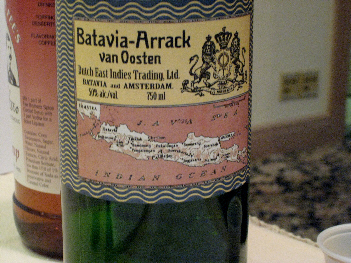 And, to ramp it up even more, he also displayed a bottle of classic Creme Yvette from 1947 (I believe — though it may have been 1944, if I could find my notes), the cork to which had cracked in transit, meaning he had to pour out the bottle to everyone assembled. Enough? Not quite. After the session ended, I was approached by Lenell Smothers, who introduced herself to me and mentioned that, in my meandering presentation, I’d mentioned Jamie Boudreau’s Picon replica (details and recipe in my story in the current issue of Imbibe), and how I’d love to try it next to classic Picon … if only I could find some. Fetching a hip flask from her pocket, Lenell said, “Take a snort — it just has Ted’s cooties on it.” Holy Mary! Jamie advanced and soon we were pouring samples of classic Picon and Jamie’s replica — Doc, who has the most experienced palate of us all, proclaimed it almost entirely sound; perhaps the only change would be to tweak back the replica’s sweetness just a tad, and it would be spot on. After the seminar, I also had the great fortune to meet two incredible women: Misty Kalkofen, who tends bar at Green Street in Cambridge, Mass, and also writes for LUPEC-Boston; and Lauren Clark, who maintains the incredible blog over at DrinkBoston.com. Thankful that the panel was over, I walked over to the Acme Oyster House for a quick bowl of gumbo with Robert Simonson from Off the Presses, then headed back to the hotel for the Cocktail Hour, where I planned to wander around, sip a bunch of fine cocktails, and relax before getting ready for the Spirited Dinner. Sure enough, Dave was right — somehow I’d missed any mention that I was to be working the event, but right there was a poster with my name on it, a stack of recipe cards and a big bucket of premixed Procrastination Cocktails. After begging a cocktail shaker off a member of the hotel staff, I started shaking up samples for the crowd, which was a pretty weird experience considering how flustered I was to even be back there in the first place. Soon, though, Rick and Gretchen came by, joined by Brad Ellis, and I began to get into a groove. 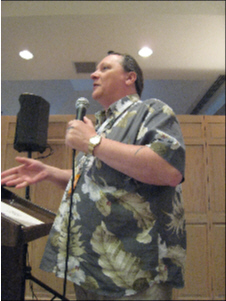 Finally, though, I had to make a run for it, as I’d wound up mixing drinks during the time I’d meant to spend preparing for the Spirited Dinner, so I had ten minutes to go upstairs and change for the event. So, for the “Lost Ingredients” panel, my ingredient was lost, and at the cocktail hour I’m late to mix up the Procrastination Cocktail. Thank god I didn’t specify the Death in the Afternoon. >> odd people in the room. No worries. You done good. Thanks for your participation on this event. Your praise for the whole Tales of the Cocktail is really quite understated. 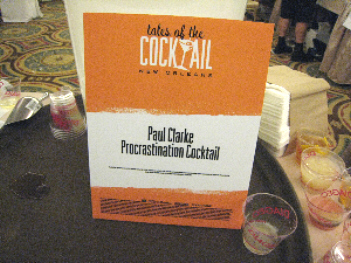 The Procrastination Cocktail is the greatest drink name of all time. Stir with ice & strain into cocktail glass; garnish with twist of lemon. One of my very few originals. I think the staff at the Monteleone did a superb job mixing this drink.